The brand new stunning Titan™ 8 is the latest passive, two-way loudspeaker introduced by Wharfedale Pro. The Titan™ 8 combines the newest technologies, materials and design topology, including a titanium compression driver and heavy-duty cast-frame woofer, to ensure absolute accuracy, high output and the smooth, wide dispersion of the critical mid and high frequency ranges. Titan™ 8 enclosure is created using state of the art, gas assist injection moulding technology, enabling us to mould thicker, hollow core enclosure walls, which are stronger, sonically superior and much lighter in weight than standard injection moulded enclosures. Also, internal laminar flow ribs further increase the rigidity of the enclosure. This intelligent enclosure design, along with a custom Wharfedale Pro transducer is essential in the reproduction of punchy low end down to 55Hz. Because of its functional cabinet design, the Titan™ 8 is versatile and easily mounted in a variety of configurations. A top stacking feature is provided for multi-loudspeaker applications and the Titan™ 8 also can be used on its side as a stage monitor. The speaker stand receptacle features a locking screw to ensure stability and rubber-padded carry handles make the job of transporting the enclosure easier than ever. Cord wrap and cable anchor features are also molded into the enclosure. Eight M6 threaded rigging points are provided for a variety of safe flying configurations with four of these inserts available, bottom-mounted, in an OmniMount® 60.0 bracket footprint. Powerful, compact, lightweight and affordable, the Titan™ 8 is the ideal choice for installation and outdoor applications. It delivers the high level, even dispersion and sonic integrity usually associated with much more expensive speakers. * The bottom of the Titan™ 8 provides a convenient built in pole mount socket for easy mounting on a standard 35mm diameter speaker stand pole. * The rubber-padded carry handles make the job of transporting the enclosure easier than ever. * Eight M6 threaded rigging points are provided for a variety of safe flying configurations with four of these inserts available, bottom-mounted, in an OmniMount® 60.0 bracket footprint. Using state of the art, gas assist injection moulding technology, plus an internal laminar flow rib pattern we have increased the enclosures rigidity and reduced its weight compared with standard injection moulded enclosures. Optional TITAN™ TOUR BAG – Ballistic nylon zippered carry bag protects your Titan™ 8 and features a storage pocket for cables. The high frequency driver is a custom designed 1.2" ferrofluid cooled compression driver. The EWG™ is designed to provide acoustically transparent high frequency pattern control. This EWG™ waveguide (horn) enables a 90 x 60 degree high frequency coverage. There are two ports on front of the Titan™ 8 that are reflex tuned to provide enhanced low frequency response from the enclosure. 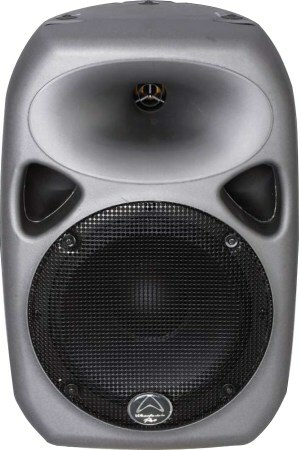 The low frequency driver is a custom designed, high quality 8" loudspeaker. The bottom of the Titan™ 8 provides a convenient built in pole mount socket for easy mounting on a standard 35mm diameter pole from a stand as well as 4 threaded inserts for a wall bracket.